Gallery (or gallerie) wraps stretcher bars are designed for inkjet canvas prints. Click here for our instructional video. IT Supplies introduces its newest line of products, Simply Elegant Gallery Wrap Solutions. Build your own canvas gallery wraps while spending less with IT Supplies’ new Simply Elegant Gallery Wrap Standard and Pro Wrap Systems. Simply Elegant Gallery Wrap Standard bars (1.25” depth) are designed for smaller wrap applications, while our Simply Elegant Gallery Wrap Pro stretcher bars (1.75” depth) are designed for larger canvas gallery wrap applications. Our wide variety of stretcher bar sizes gives you the flexibility to wrap your canvas prints to desired specifications. Standard Gallery Wrap Bars require 1.5” of image bleed and Pro Stretcher Bars require 2” of bleed for best gallery wrapped results. Braces, staples, glue and canvas are sold separately from gallery wrap bars. Simply Elegant Gallery Wrap Standard Stretcher Bars are high quality gallery wrap bars designed specifically for canvas wrap applications. Simply Elegant Gallery Wrap bars are an affordable option for users looking to reproduce canvas art prints. Our Gallery Wrap solutions are available in a variety of different sizes to meet your desired size specifications. 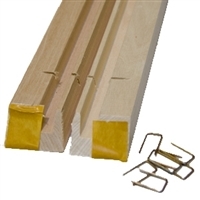 Simply Elegant Standard Gallery Stretcher Bars are 1.25" in depth and require 1.5" of image bleed for best gallery wrap results. Simply Elegant Gallery Wrap Pro bars are high quality gallery wrap bars designed specifically for larger canvas wrap applications. Simply Elegant Gallery Wrap bars are an affordable option for users looking to reproduce larger canvas art prints. Canvas Gallery Wrap solutions are available in a variety of different sizes to meet your desired size specifications. Simply Elegant Standard Gallery Stretcher Bars are 1.75" in depth and require 2" of image bleed for best canvas gallery wrapped results. 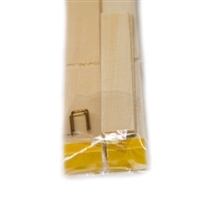 A stretcher bar kit is available as well for users looking to try gallery wrapping canvas.